The following exhibitions serve to highlight the wealth of material to be found through dynamic partnerships with individuals, communities and institutions within Dún Laoghaire-Rathdown. 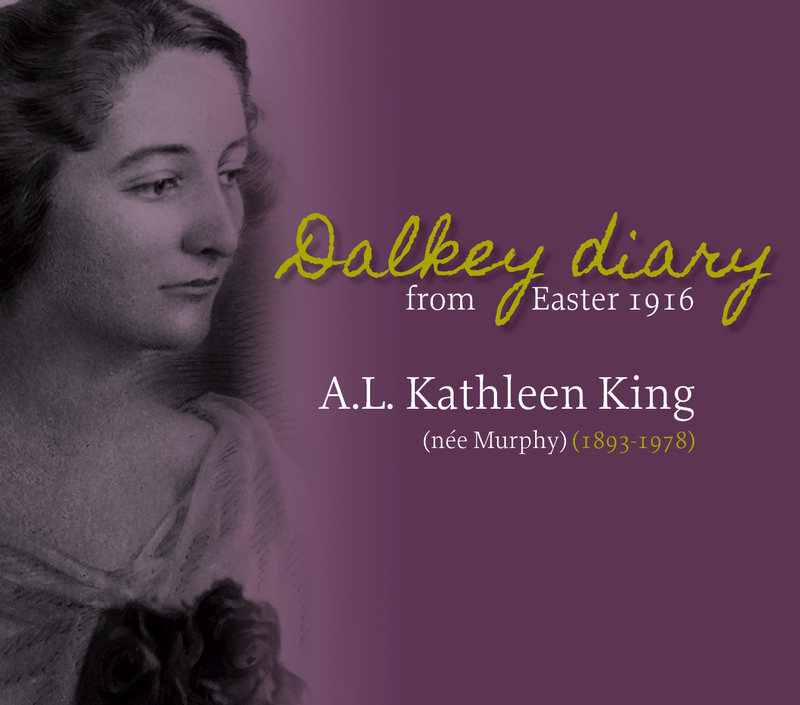 This exhibition is based on a diary written by 22 year old Kathleen King (née Murphy) (1893-1978) of Mount Salus Road, Dalkey during the 1916 Rising. It was found recently by her family amongst her collection of photos, letters, playbills and memorabilia. Kathleen moved in the same circles as Thomas and John MacDonagh, Joseph Plunkett, Edward Martyn and Máire Nic Shiubhlaigh and she was a staunch supporter of the cause for Irish independence. She married Dr Edward King in 1918 who went on to become the first Medical Officer appointed by the new Sinn Féin government. Kathleen was a prominent member of An Taisce in the 1950s and became one of Ireland’s leading bryologists. Produced by dlr Libraries with support from dlr Heritage Office and based on the loan of material from the extended King family in Dalkey. Produced by dlr Libraries in partnership with UCD’s School of History: MA Archives and Records Management, based on an archive donated by the Kenny family. Edward Lee was a businessman who, in the 1880s built a chain of drapery shops in Bray, Kingstown, Rathmines and Dublin. He was recognized for his caring attitude towards his employees and was credited with introducing the weekly half-day holiday to Ireland in 1889. He also had a strong social conscience. During the 1913 Lockout, he disagreed with the tactics used by William Martin Murphy and other employers against the strikers. Edward and his wife Annie had nine children but only four sons survived into adulthood and the Great War took a terrible toll on the family. The Lee family lived for many years in The Grange, Stillorgan and later in Bellevue, Blackrock. An associated book written by Edward Lee’s great-grandson Michael Lee, entitled Edward Lee: Model Employer and Man of Moral Courage, is available in all dlr libraries and bookshops. Price €10. Produced by dlr Libraries in partnership with Michael Lee and the extended Lee family. Minutes of Township of Dún Laoghaire, then Urban District of Dún Laoghaire, then Borough of Dún Laoghaire, then Dún Laoghaire-Rathdown County Council 1888 to date. Current photographs of the county from the 1960s to date. The Department holds a large collection relating to both Ireland in general and Dún Laoghaire-Rathdown in particular. Examples include rare editions such as Grose's Antiquities of Ireland (1791), and Warburton's History of the City of Dublin (1818). Events of national importance e.g. 1798, the Famine, casualties in the Great War, etc. are also covered. The twentieth-century Acts of the Oireachtas (Irish Government), from the foundation of the State (1922). The collection also includes selections of Dáil Debates (Irish Parliament) and Seanad Debates (Upper House) from 1994, as well as also including selected government reports. The world's largest online database of Irish newspapers. Includes many of Ireland's leading national, regional and out of print titles from the 1700s to the present. Searchable archives of The Irish Times back to 1859. Contains over 16 million articles. Digital archive which includes more than 1,500 leading academic journals in the humanities, sciences and social sciences, as well as select monographs and other materials valuable fir academic work. 19th Century Historical Maps Collection can be viewed online at UCD Digital Library. This website is for accessing large-scale historic maps for almost 150 cities, towns and villages in the Republic of Ireland. The files cover all aspects of the history of the county, and are continuously updated with material from current publications, newspapers, and historical journals. They also include a series of audio cassettes containing interviews with, and lectures by local historians.